Creates any number of transactions in the account. Please be aware if you send a transaction and the provided contact does not exist, the transaction cannot be sent. The reason for this behavior is the strict interpretation of Maileon regarding contact permissions. If no permission exists, Maileon will never send an email to that contact. The preferred way to deal with such cases is to synchronize the contacts with Maileon properly with the correct attributes and permissions. However, if there is any reasons for situations where you want to send transaction mails to contacts that might not exist, you can wrap the contact in an import statement (see table) and provide a permission that should be assigned to the contact, if it did not exist. This fallback solution will only create a contact with an email (and optionally an external id). To keep the data stream small, fast, and efficient, no further contact details are submitted. If you needto submit more data, you need to properly create the contact first. In order to ensure timely processing of your transactions, a size limit of 9M (9,000,000 bytes) for the request entity is enforced by the API. If you need to submit batches of transactions that are bigger than that, please split them up into individual requests. ignore_invalid_transactions true If set to false, exceptions like invalid contacts will cause the service to return 400 Bad request. contact yes* * Either contact of import is required. If both are specified, only the „import“ cantact is used. import.contact.email yes** ** required, to create not existing contacts. The email address of the contact to send the transaction to. import.contact.external_id no the external ID of the contact to send the transaction to. This can be set in addition to the email, if the newly created contact should be registered with an email and the external ID. import.contact.permission yes the permission that should be used when creating the contact. Do not use permission 1 (none) here as Maileon is not allowed to send any mail to contacts with „none“ as permission. attachments no A list of attachments that will be sent to the receipient along with the transaction e-mail. Note that this is only guaranteed to work if the transaction results in a single mailing (i.e. there is exactly one trigger mailing defined for the transaction contact event). attachments[i].data yes, if an attachment is submitted The binary contents of the attachment, encoded in Base64. The total amount of data per Transaction may not exceed 1MB (that is 1,000,000 bytes) when decoded to binary representation. Please note that the size of the entiry HTTP request entity may not exceed 9MB (9,000,000 bytes) in total. 400 Bad Request If there was an error in the submitted body. In this case, an XML-form error message that explains the problem is produced. 413 Request Entity Too Large If the submitted entity was larger than 9M (9,000,000 bytes). If your request contained multiple transactions, you may be able to fix the problem by splitting it up into separate requests. The request returns a report that details if queuing was successful for each transaction. Note that if one of the transactions is invalid and ignore_invalid_transactions is false, a 400 Bad Request response will be generated instead. "message": "No valid contact identification provided for transaction." The following code is based on the PHP Api Client. 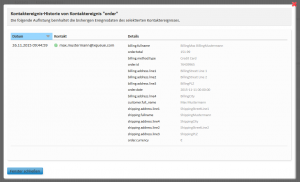 We will show you how to create an order confirmation mail from some imaginary webshop. The preassumption is, that you already have some experience with Maileon and that you know a little bit about PHP. If there are questions like „how can I add a transaction type“ or even „and what is a transaction type? ?“, just drop an email to: service@xqueue.com. The first step is to create a proper event type. We provide a generic type in the above package which contains some basic information (like the items, shipping/billing address, …) and some free values (generic_fields.string1-10, which you can freely set in your shop and print it in the mailing, e.g. if you want to provide different additional vouchers for the next shopping tour). Now it’s about time to use the event type and fill the values. Go to the event type in Maileon and note the API ID of the type, e.g. 235. The following code will create an event of type 235, which is in our test account the order confirmation type from above. // Finally send the request. Here you should log or check the response. In this case, I provided „151.99“ instead of 151.99 (notice the „“ around some value indicates a string). If you have a trigger mailing active that listenes for the event, it will now be sent to the given email address. Create a single transaction event providing your API-Key, a transaction type ID and an email to send the (empty) transaction to. This example expects, that you have created a transaction type inside Maileon with no mandatory attributes. 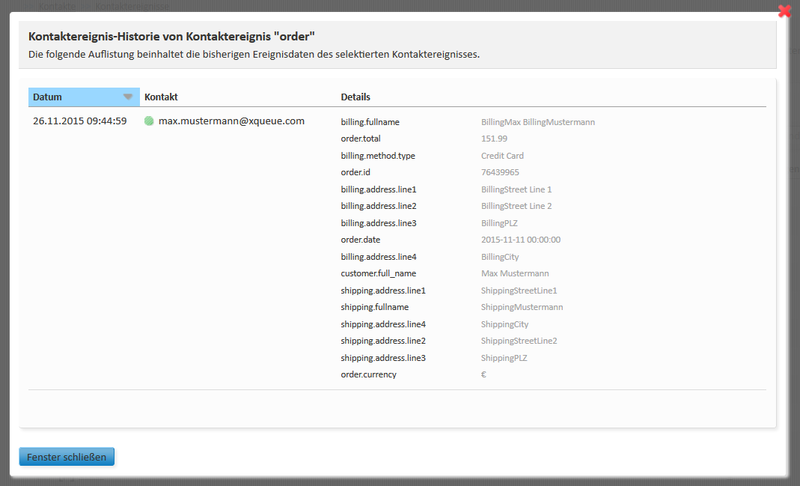 This example can also create the required transaction type for our (minimized) sample order event, if required.